Today was a very special day for Doug Parker. After 14 years without Central Air Conditioning, he finally has working AC in his home. In addition, he can now open his garage, park his vehicle and safely enter his home. Doug Parker, 77, lives alone in his well-kept, older North-East Cape Coral Home. 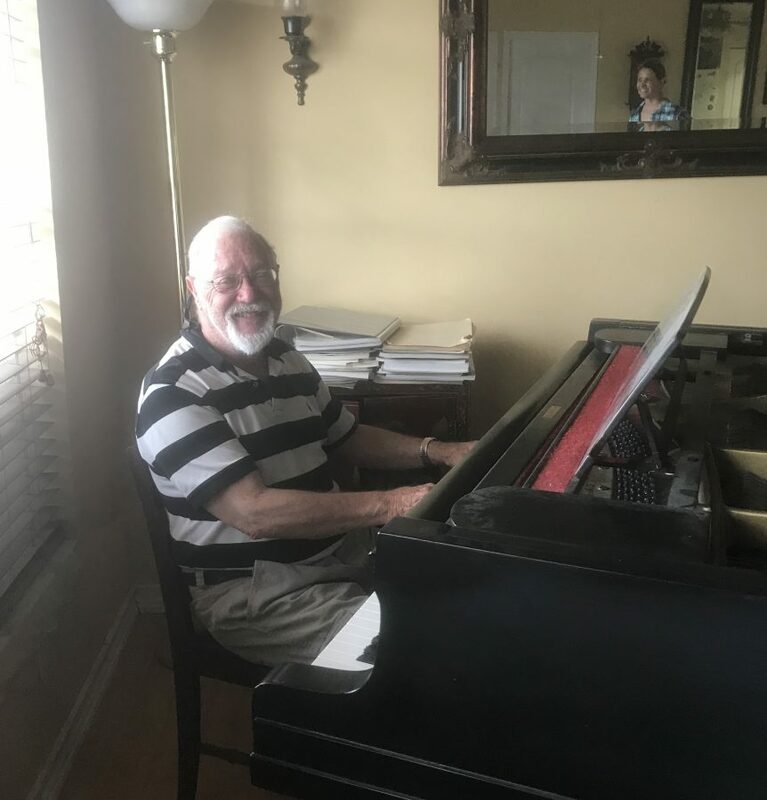 A talented musician, he served as his church organist for 54 years and eventually retired his profession as a music teacher. Relying on social security as his only income, Doug occasionally rents out a portion of his home to alleviate his financial hardship. He has even entertained the idea of offering in-home music lessons, as he is passionate about the arts and the importance of teaching children music as a core component of their early education. A man of faith, Doug has done his very best to live within his means. However, there were some home repairs he simply could not afford to make. His central conditioning system was 23 years old and quit working several years ago. In addition, he could not use his attached garage because the garage door opener needed major repairs. It was too difficult for him to open and close the door manually, which prevented him from using the garage for several years. After learning Doug’s situation, both companies immediately stepped in to help. Mr. Parker, holding back tears, cannot thank everyone enough for these wonderful gifts. He forgot how wonderful it is to feel safe and comfortable in your home. A very special thank you to Action Automatic Door & Gate and Haines A/C & Refrigeration for stepping in and helping one of our neighbors in need!! Builders Care is the nonprofit charitable arm of the Lee Building Industry Association (Lee BIA). Its mission is to provide emergency home repairs and construction services to elderly, disabled and economically disadvantaged people who are unable to obtain home repairs through traditional means. To date, Lee BIA Builders Care has put more than $4.5 million in construction services back into the community at no cost to homeowners in need. Builders Care enlists the volunteer services of Lee BIA members and leverages grants and donated materials to provide construction and remodeling services to qualified homeowners throughout Lee County. Builders Care is headquartered at 6835 International Center Blvd. Suite 4 in Fort Myers. The Lee Building Industry Association (www.BIA.net ) is a 64-year-old association affiliated with the National Association of Home Builders and Florida Home Builders Association that serves to strengthen our community by advancing a professional building industry through advocacy, education and services. Donations can be made online at www.LeeBuildersCare.org, or to the Builders Care general fund at BB&T Page Field branch at 4959 South Cleveland Ave. in Fort Myers. More information is available by calling 239-938-0056. Follow Builders Care at Facebook.com/LeeBuildersCare or on Twitter @LeeBuildersCare.